The Yealink T29G is currently the most advanced model in Yealink's T2x line. Offering a rich feature set at a highly competitive price, it may be the perfect phone for executives and their assistants. The T29G was evaluated using one of our PBX test setups. We reviewed most of the key features and have documented our findings below, including setup information and key technical specifications. The T29G packs a lot of features and supports up to 16 SIP accounts. It is relatively low priced considering this is the highest end model in the T2X family. It is a great option for executives and their assistants and looks great on any desk. It is also considerably cheaper than equivalent phones from Cisco or Polycom. The LCD color display is large (4.3", 480 x 272 pixels) with 16 bit color depth and is back-lit. It is a non-touch display so the navigation buttons are required to move within menus. The T29G has 10 line buttons that can actually be configured with a page button which gives access to 27 features (3 page mode). The phone supports Busy Lamp Field (BLF) functionality which is great for receptionists, assuming your service provider supports BLF. For example, you can use this to see who is currently on a call, transfer with the touch of a button, pick up other extensions that are ringing, perform speed dial, park calls and much more. We tested these features and they worked as advertised. An expansion module can be purchased to increase the number of line buttons. The quality of the audio is very good through the handset and reasonable in speaker mode. A wide range of Codecs are supported so you can fine tune for audio quality or bandwidth. Due to the size of the display, Yealink has provided great access to its settings directly from the phone, especially adding and editing contacts in your phone book. We still prefer to use a web browser for configuring SIP accounts. On the subject of settings via a web browser, Yealink has finally added good in-line context help, including variable names for the fields for those that wish to auto provision their phones. This has been lacking in the past so we are delighted to see this. The T29G has a USB connector that can be used for Bluetooth wireless headsets. It also has an RJ9 analog connection for headsets. Yealink has performed compliance testing on a number of headsets for the T29G (see helpful downloads section). A WiFi USB adapter (Yealink WF40) can now be used for the T29G (Figure 1 below). This small device retails for around $25 and can be plugged into the USB connector on the back of the phone. This is very useful for those that have limited access to hard wired Internet. We tested this adapter and it worked very well. You will need firmware version 46.81.0.15 or newer in order to use the WF40. This may have been an issue with out test setup (Freeswitch) but we had to use UDP for all SIP control. When using TCP and testing BLF we had issues with the phone losing registration, whereas UDP was fine. Newer versions of firmware may address this as issues such as this are now stated in the firmware revision history. The phone supports Power over Ethernet (PoE) and for this reason Yealink does not include a power supply as standard. Most small businesses do not have PoE so, in our opinion, a power supply should always be included with the phone. Note that there are a few vendors that sell the T29G packaged with a power supply. It would be nice if firmware updates in the phone portal could pull the latest versions direct from the Yealink servers, similar to what Cisco does on their phones. Instead you need to go to the Yealink website, download the firmware ROM file and upload it to the phone, so some extra steps are required. On the plus side, this will likely force you to read the firmware revision history before downloading, which is always advised. Great deal. For around $135 to $150 this phone packs a punch. Easy and intuitive to use with a large color display. 16 SIP accounts and 10 line buttons open this phone up to a large target audience. Good headset options, including Bluetooth via USB. Firmware version 46.81.0.15 supports the WF40 WiFi USB adapter ($25). The Yealink T29G is an impressive phone. 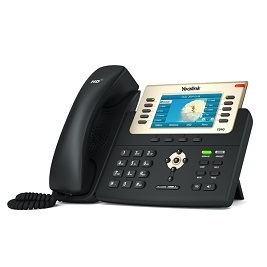 If you were to buy a phone with this feature set from Cisco or Polycom it would likely cost at least twice the price. It looks very stylish and is perfect for executives, their assistants and receptionists. Ethernet cable and handset cable. In our opinion, the best way to setup the T29G phone is to use a web browser. 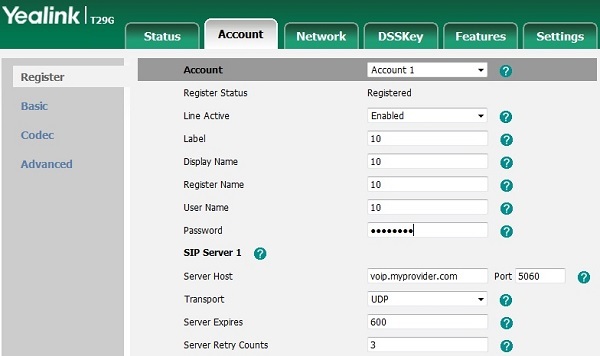 For simple configuration the advanced menu on the phone may be used but it does not give access to every setting, for example the protocol setting (UDP or TCP). For the purpose of this review we will use a web browser. First of all, press the OK button on the phone. This should show the status for the phone, including the IP address. Using a PC on the same sub-net as the phone, type the address into the address bar of your favorite web browser, such as Firefox. You should be presented with the login screen for the T29G. The factory default settings for username and password are both admin so enter those and then press the confirm button. You should now have access to the T29G phone portal. Press the Account tab and enter the details for Account1 based on the credentials given to you by your service provider. An example is shown in Figure 2 below. In our opinion, the Yealink T29G is an excellent phone and offers an impressive feature set at a great price. If you have anything to add please submit a comment or question using the Q&A tab at the top of this page. If you have experience using the T29G submit a user review using the Add Review button. We're sorry, there are currently no user submitted reviews for Yealink T29G matching your search criteria at this time. Please add your own review or check back later as reviews are being submitted often.